This is another of the aphid genera that is represented in North America mostly by adventive species from elsewhere in the world. And, like some other genera, there are just a few native species that seem remarkably similar, and closely related to, the exotic species. Based on my field work and slide mounts, it is obvious that North American Capitophorus still need further study. 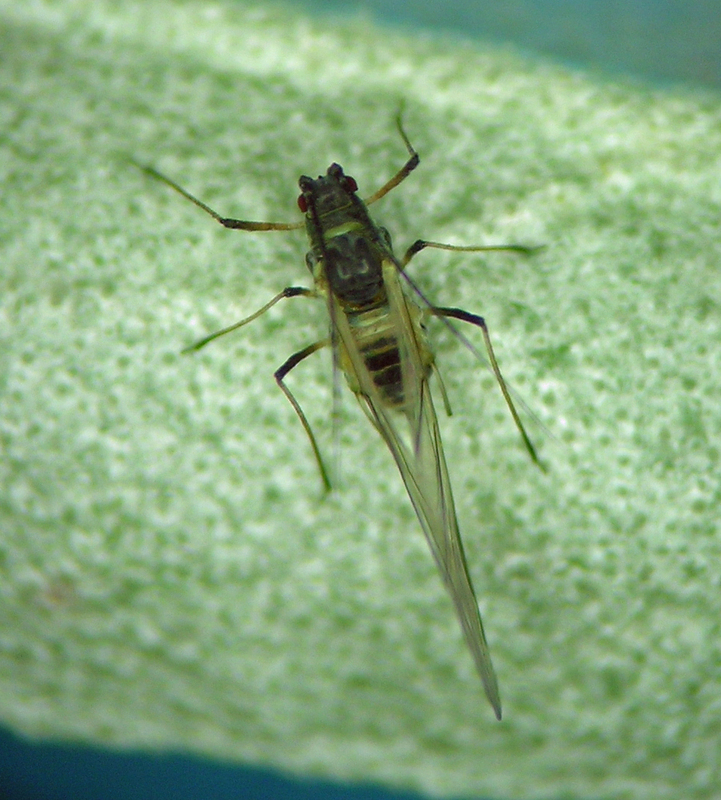 For example, another recent complicating discovery is the widespread occurrence of a Capitophorus on Iva axillaris (poverty weed). It is similar in general shape and morphology to the thing I call C. shepherdiae (see below) when collected on Ambrosia, but it has some key differences as well. The alate vivipara of one of the Capitophorus species that I find on native Shepherdia in the mountains of the western U.S. 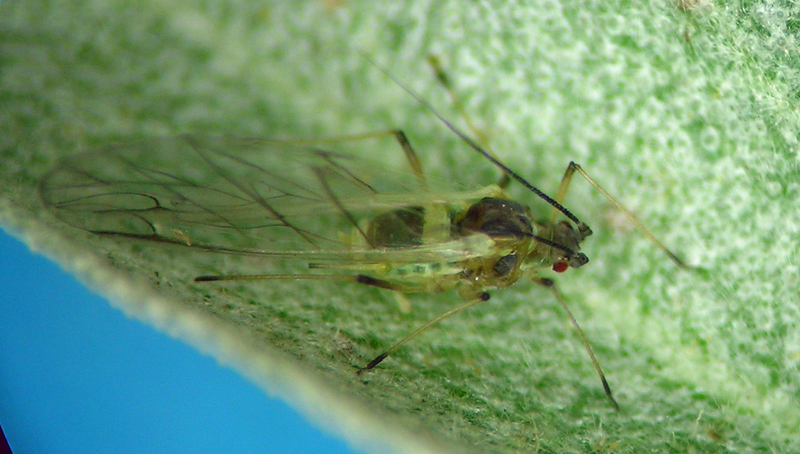 This aphid is widespread in North America, and especially common everywhere I have lived in recent years due to the ubiquity of its primary host, Elaeagnus angustifolia (a.k.a. Russian olive), which is common in the arid interior west, growing along natural and artificial waterways. Consequently, I have many photos and specimens, the hope usually being that the specimens will turn out to be something less common that will shed light on the questions I have about Capitophorus taxonomy. Inevitably, almost all collections turn out to be the easily recognized C. elaeagni. This species migrates to thistles and related plants and is very common on various Cirsium species including Cirsium arvense (Canada thistle). Capitophorus elaeagni, I think fundatrices, from Eagle, Idaho in April. Capitophorus elaeagni oviparae on Elaeagnus in October. Their colors are striking and variable. Capitophorus elaeagni male from Idaho in October. This is the other very common Capitophorus species in my area that is introduced from the Palearctic. It overwinters as eggs in most areas I’ve collected it, on Elaeagnus angustifolia (a.k.a. Russian olive). This tree grows as a weed in wet places in otherwise desert environments. 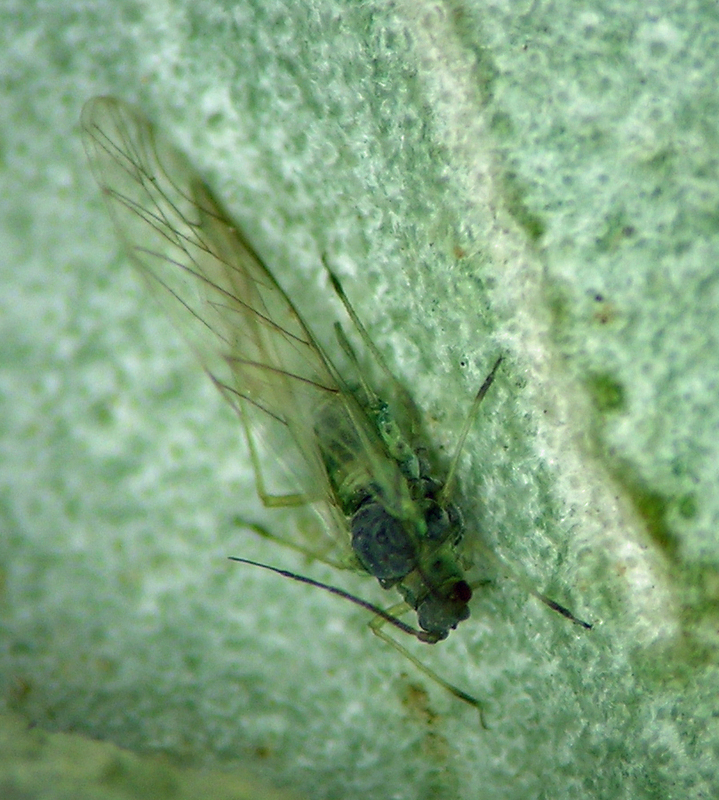 In wetter and warmer habitats, such as west of the Cascade Mountains, this aphid probably overwinters as viviparae on it summer host, Polygonum. 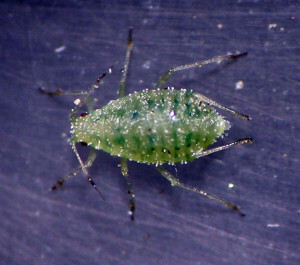 This species was among the first I collected and tried to identify, way back in the 1980s. 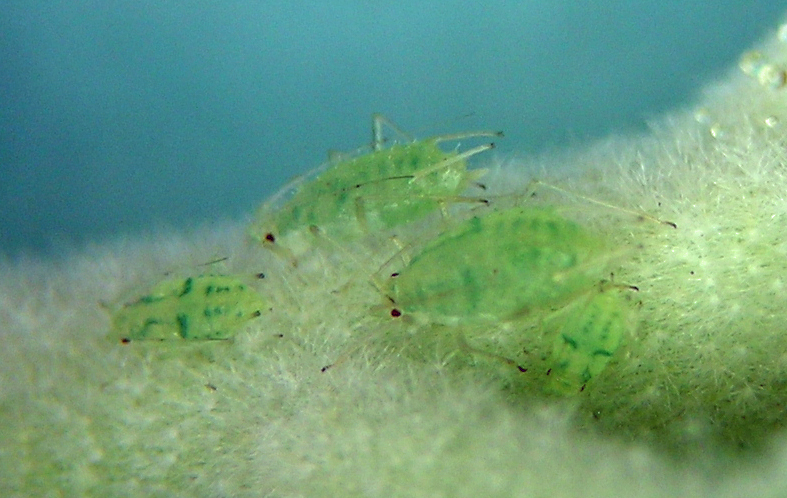 In those days I collected it very frequently in yellow pan traps meant to catch potato pest species such as green peach aphid, Myzus persicae. It was obvious to me that C. hippophaes was not M. persicae, but it took me a couple years to arrive at the correct species identification. 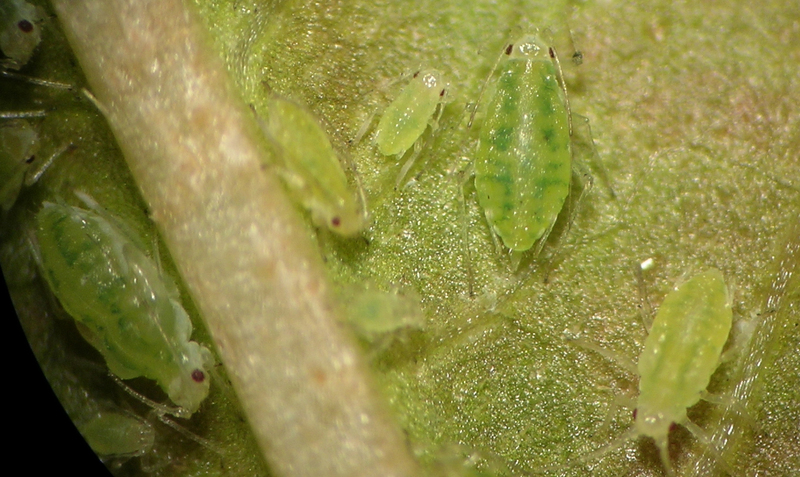 Of course this all occurred before Blackman and Eastop’s pivotal work on aphids of the world, and in the time when my only aphid identification resources were Aphids of the Rocky Mountain Region by M.A. 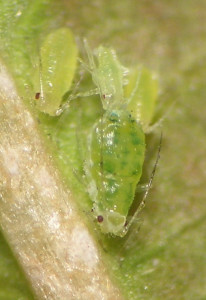 Palmer (1952) and Aphids of Illinois by Hottes and Frison (1931). They were actual books made out of paper. Capitophorus hippophaes on a Polygonum species in Moses Lake, Washington. This is where Capitophorus becomes far less clear taxonomically. Capitophorus cf. shepherdiae from Ambrosia in central Washington. Based on morphology, it sure seems to me that the common species found on Ambrosia out west is C. shepherdiae, but heteroecy has never been proven. Further, I have a sample from Elaeagnus, which further complicates the picture. I have samples of apparently this species from native Shepherdia in Oregon, Idaho, and Utah, and from Ambrosia in Colorado, Idaho, Washington, Utah, Nevada, and New Mexico. My guess is that this species is native to western North America. It may or may not be correctly identified as C. shepherdiae. The recent discovery of a widespread form on Iva axillaris (see above) further complicates this scenario. Capitophorus shepherdiae alate vivipara on Russian olive in the fall.